After completing a professional basketball career, Tom joined Northwestern Mutual in December of 2010. Since then, Tom and his team have worked to create a lifetime of financial security for the families and business owners with whom they work. Tom's thriving practice focuses on creating personalized, comprehensive financial strategies that incorporate planning, investments and insurance. Tom actively is involved in training and development activities. 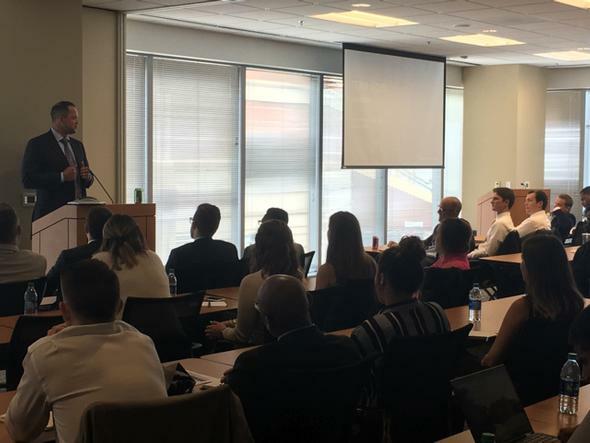 Pictured here, Tom leads a talk to support the growth and development of professionals new to Northwestern Mutual and the career.